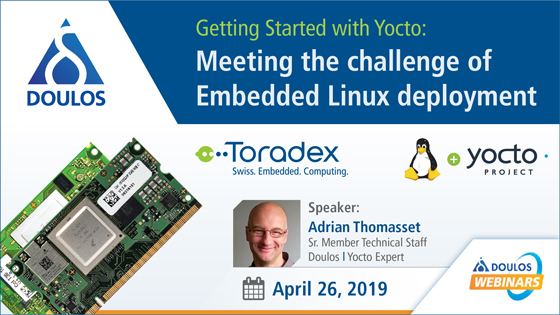 Toradex's partner, Doulos, brings forth an interesting training webinar, which delves into how a minimal Linux system can be extended to include custom, packaged software. Doulos demonstrates how standard Linux tools, such as gdbserver or the Target Communication Framework agent (TCF agent), drops out of the build system and can be used in a stand-alone SDK. In the process, key concepts of the Yocto Project build system such as recipes, tasks and layers will be introduced. A board from the Toradex Colibri Arm family of SoMs will be used as an example platform.